Exercise releases feel-good endorphins which increase positivity and reduce depression & anxiety, both of which can lead to relapse. Frequent exercise gives the body the physical strength to overcome cravings for drugs and alcohol – it increases blood flow around the body and to the brain thus increasing energy levels, motivation & mental alertness; it builds muscles that have been underused. Fitness is an integral part of our treatment programme and we make sure that all patients in Extended Treatment have plenty of access to the gym as well offsite visits to local swimming pools. Our extensive grounds offer the perfect location for outdoor acitivities such as jogging, walking and volleyball. 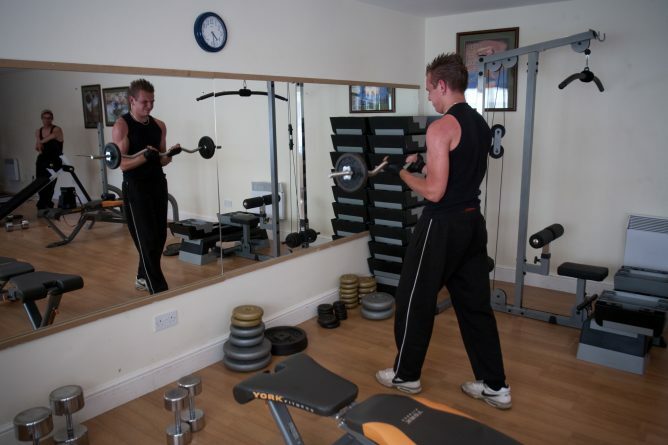 We have a gym, based at Extended Treatment, equipped with cardio equipment, weights and a PowerPlate. Fitness activities include aerobics, bokwa and circuit training. Qualified fitness staff are always on hand to help and advise patients on their fitness regimes. Our fitness team includes Jo Sutherland, David Kilgour and Murray Thomson, all experienced trainers. We provide personalised exercise programmes for those with specific needs. We offer DDP Yoga, a vigorous form of yoga which strengthens core muscles, increases cardio output and improves flexibility.